This week’s Weekend Wallpaper comes to you in the form of a 1960 Chevy Impala Hardtop Sport Sedan. In the 1950′s, one could eat at a drive-in burger joint, see a drive-in movie, and then find a nice lookout spot to …talk openly about inner feelings. An entire date could be completed without ever leaving the car! This should make you both long for these bygone days, and think differently about those seemingly innocuous old classics at the car show–they have seen some things in their day! This particular model was designed at the tail-end of the chrome and fins era. It’s Batmobile-esque lines give you the sense that those frisky teenagers were able to fly from location to location, easily having the car back to Dad by 10pm. 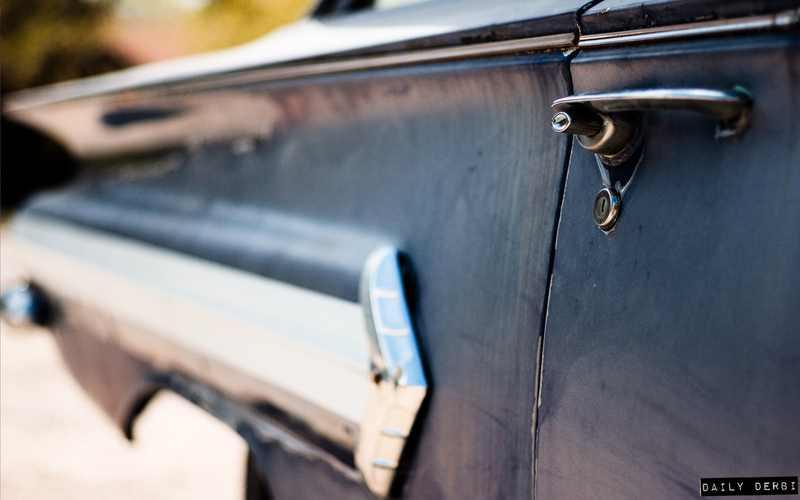 Weekend Wallpaper is a weekly series featuring the auto photography of Tyson Call. You can see more of his work on Flickr, or follow him on Twitter. Charter Bus Maryland on April 25, 2011 at 2:48 am. The 1960 Chevrolet Impala shifted direction a little, creating a more conservative look than was seen on the redesigned 1959 model. Looking back from today’s vantage point, the ’59 Chevrolets don’t look nearly as outrageous as they did at the time. In the eyes of today’s collectors and enthusiasts, those scoffed-at tailfins are a major part of the car’s appeal — the bigger the better. Stylists and marketers back then, on the other hand, realized that the fin-and-chrome fashion had about run its course. They needed to shift direction a little, creating a more conservative face-lift. chevrolet impala ss 2010 on May 5, 2011 at 6:27 am. I feel 60′s impala is more attractive and good compared to the present model.